Discover Name Change Now T-Shirt, a custom product made just for you by Teespring. With world-class production and customer support, your satisfaction is guaranteed. This shirt would be perfect if there was some sort of addition to explain the dropping of the UNC relating to us. Either a C-Pick logo under it or on the back…or a University of Charlotte under it or on the back. Maybe a Univesity of Charlotte up top…and #droptheunc under it as if it has been dropped. 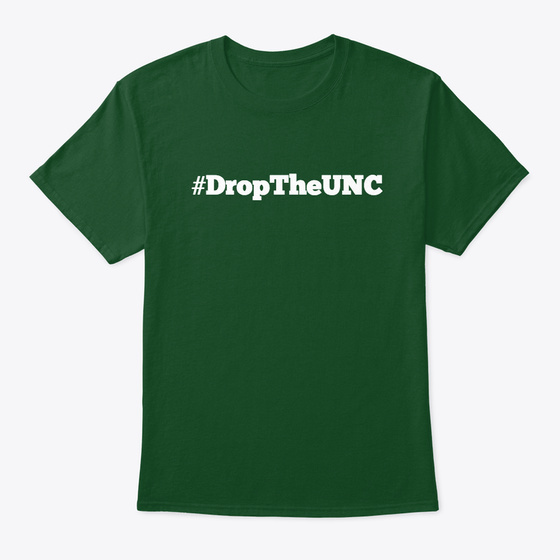 As is…it’s just a green shirt that says drop the unc. Wish there was some tie-in to show it’s US that wants to drop the UNC. I definitely can’t use a C-pick. Unfortunately once live I can’t make any tweaks to the design, but I’ll see about it. If no purchases yet, I can pull down and add “University of Charlotte” on the back, if it’ll allow me to. Or maybe even just Charlotte on it? Idk? And maybe flip flop sides. Charlotte or University of Charlotte on the front…#droptheunc on the back? I’ll have a version up in the morning. Can you fit the Name Confusion Log on the back? Will it come in a “petite” size? Phil’s birthday is coming around. That would indeed be a nice gift for Phil.